AOL Toolbar - Boost Your PC. The AOL Toolbar is a browser toolbar for Internet Explorer, Firefox, and Flock. It has a few default buttons like Mail, Weather, and Radio, and also allows the user to add additional buttons. Third parties may from time to time offer applications or services to access, “plug-into” or interact with the Software. The AOL Toolbar is one of a range made by AOL, which include toolbars branded with their other properties, such as AIM, MapQuest, AOL Radio, and Winamp. There are three separate components to AOL Toolbar: AOL Toolbar, Download Updater, and Price Check by AOL. All three components need to be removed to complete the uninstallation of AOL Toolbar from your browser. Download Boost and enjoy your PC. Remove AOL Toolbar from your PC. Why should I uninstall AOL Toolbar? Removing unwanted toolbars is usually a good idea, unless of course you actively use it. The AOL Toolbar, like other web browser extensions, can potentially have adverse effect on your web browser's and overall PC's performance and stability. To the right of the list item, click the Uninstall button and Boost will completely remove AOL Toolbar from your PC. Use Add/Remove Programs control panel in Windows makes to uninstall AOL Toolbar. Follow the appropriate instructions below to use this control panel. Select AOL Toolbar from the list of programs, and click Uninstall. Alternatively, right-click the program and select Uninstall. Select AOL Toolbar from the program list, and click Uninstall. Alternatively, right-click the program and select Uninstall. Select AOL Toolbar from the list of programs and click Remove. 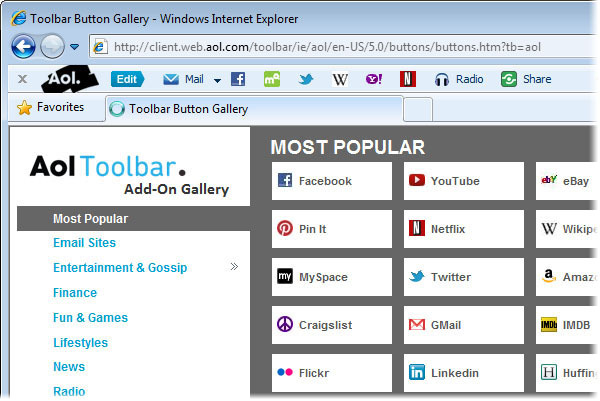 Boost helps you remove AOL Toolbar and optimize your PC.